The company performed two pieces: 1976's Squaregame, resurrected for this farewell tour, and 2003's Split Sides, a noted collaboration with the art rock bands Sigur Rós and Radiohead. As the front curtain opened, it became clear that every other curtain on the stage was up, too, revealing in vivid light all that's usually obscured, backstage, during a performance: tall ladders, machinery, massive crates stacked five or six high, countless cords and dollies, wires and thick ropes. It was a rich visual cacophony, and the stage space seemed suddenly huge. After the dance began, there were moments when I stopped paying attention to the dancers and focused instead on the staggering landscape of things that surrounded them. The dancers performed on a white square, bordered on two sides by astroturf. Their costumes were '70s rehearsal clothes in soft, muted colors. White cylindrical canvas bags, full but light, served as props and set decoration. The movement quality in this dance was especially fragmented; individual body parts were especially articulate. It seemed to be a dance about joints. It's also a dance about watching, because frequently, dancers sat down, alone or in groups, to carefully watch the others. Robert Swinston, the dancer who performed the solo originally danced by Cunningham, looked remarkably like the late choreographer, both in appearance and movement style. The effect was uncanny and disorienting, and I felt momentarily out of time. The score, by Takehisa Kosugi, is better described as electronic sound art than music. It undulated and burbled, submitting sounds of the human voice to processes and modulations that resulted in a kind of globular, biological soup. I kept imagining the contractions of the dancers' muscles, and in extreme close-up, the movement of their and cells and blood. Finale: several dancers are running, and one takes a canvas bags and hurls it into the air directly above him. It soars; he catches it. Lights out. Cunningham, like his partner and collaborator, the composer John Cage, was known for using chance in the composition and performance of his dances. This piece, comprised of two different sections, has 32 possible permutations. On stage, before the performance, five rolls of a die determine the order of the two dances, as well as the two distinct costumes, set designs, lighting cues and scores. Seeing a live dance is a rare thing. Seeing any one of the 32 versions of this dance is rarer still. We heard Sigur Rós' music first and Radiohead's second. Both bands fashioned relatively challenging soundscapes that respect Cunningham's avant garde musical legacy. The biological imagery of Kosugi's Squaregame score was transferred to the costumes in Split Sides. 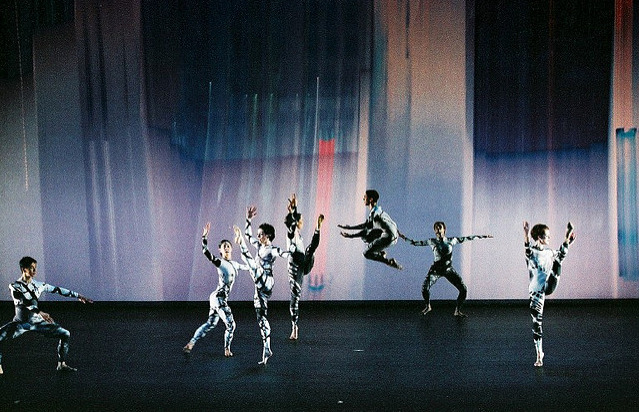 Golden and deep pink in the first half of the performance, black and silver in the second, both sets of costumes featured expressionistic splatters and lines that traced like tree branches or veins. The silver and black costumes fit the dancers like a second skin, lending them a sort of metallic, extraterrestrial quality (only enhanced by their characteristically "unnatural" movements and an important, repeated gesture: craning their necks, they tilted their faces expectantly to the sky). There was so much to see in this dance. Too much, in fact. Cunningham was known for quoting Einstein: "There are no fixed points in space." He applied this principle to his dancers, telling them that whichever way they happened to be facing was front, and constructing his staging so that it reflected a vision of "many centers." In doing so, he liberates the spectator from the pressure to see everything; since so many dancers are on stage doing so much at once, alone or in groups, seeing everything becomes physically impossible. I felt free, therefore, to spend whole minutes watching only two dancers after they suddenly came together and danced a smiling, joyful duet amid the controlled chaos of other moving bodies. For the same minutes, those two dancers must have only skirted the edges of another spectator's vision; this, in aggregate, is the kind of perceptual freedom that a Cunningham dance offers. During the post-performance Q & A, Robert Swinston talked about the future of the dances, now that Cunningham has died & the company is disbanding. He said that there will be a small group of dancers who will be taught the dances and who will pass them on to other companies and later generations. I am in love with this absurdly romantic idea: a chosen fraternity of artist/athlete/disciples, dancing not to perform, but to remember. Shortly after Split Sides began, the house lights came up, momentarily disorienting the audience. For no more than 20 or 30 seconds, we were nearly as illuminated as the dancers, who continued uninterrupted. I felt certain that this was intentional, but later learned that the lights had been inadvertently triggered, a mistake that was corrected for the next night's performance. How lucky to have been there for this extraordinary misstep, which couldn't have been better-suited to Cunningham's work. The choreographer spoke often of waking audiences rather than lulling or hypnotizing them, and the quality of the gradually brightening light, accompanied by the then-tender Sigur Rós music, was dawn-like. Chance was an integral part of Cunningham's work, and by chance alone, Split Sides echoed the meta-performative aspects of Squaregame. The accidental light compelled us to look away from the dancers and around at one another; it reminded us that we were members of an audience, all watching the same dance, yet each, alone, watching our own.